In Roald Dahl’s Charlie and the Chocolate Factory, Wonka Bar fever sweeps the world as children (and adults) tear into millions of Willy Wonka’s candy bars in hopes of finding one of five golden tickets. That same fevered anticipation blanketed civic and business meetings across the nation as leaders discussed (planned? plotted? prayed?) how to be on the short list for Amazon’s second headquarters. Local and regional committees developed packages of tax incentives, boasted of their educational systems and labor forces, and worked to position themselves to entice Amazon to set up shop in their area. Even those who didn’t submit proposals heard frequent conversations among civic and business leaders around how to get a game-changing headquarters like Amazon. Some cities were able to pursue the Amazon opportunity with the coordination of Veruca Salt’s father, creating realistic and compelling proposals; twenty such communities are now on the short list. So what does that rethinking look like? Some cities who made the cut and who also made recent transit improvements can provide a model. Raleigh, NC and Indianapolis are both on the short list. Although some believe it was their business environment and active, younger labor force that tipped the scales for them (rather than transit), both Raleigh and Indianapolis passed taxes within the last 18 months to pump local dollars into their mass transit systems. Columbus, OH, also an Amazon headquarters finalist without a large transit system, received a renewal of a quarter-cent tax for transit in 2016. Each has ambitious plans for transit expansion. Of course, there’s more to the story. Some communities that didn’t make the cut, like Grand Rapids, MI, just renewed a tax for transit in 2017. Houston also wasn’t named a finalized, even though it revamped the transit system in 2015 to be more responsive (with increased ridership as a result). But as Andrew Van Dam’s analysis in the Washington Post pointed out, the US cities that made the cut could check the boxes of having top levels of educated technical works, large public transit systems, and active young labor markets. None of them is lacking mass transit. How many of these boxes will Greenville, SC check the next time an opportunity like Amazon HQ2 comes up? Posted in UncategorizedLeave a Comment on Who cares about funding for transit – and why? 2017 was a year of significant progress at Greenlink, Greenville County’s public transit system. Thanks to the leadership of its staff and board members, Greenlink is making changes to be more responsive and rider-friendly in the near term and to anticipate growth and community needs in the future. Adoption of route changes. Greenlink completed twenty public hearings to share results of its Comprehensive Operational Analysis (COA) of the system and the route changes it recommends. These changes, approved by the Greenville Transit Authority board in December, will be the first significant adjustments made to the routes in decades. Community members who attended the sessions were excited to see plans to add more bidirectional service and more transfer points outside of downtown, and riders of the busy route serving Furman, Cherrydale, and Rutherford Road were thrilled to see that this route will be split in two to improve crowding and on-time service. Addition of an Intelligent Transit System (ITS). Thanks to the philanthropic support of our partners The Graham Foundation, Hollingsworth Funds, and the Jolley Foundation, Greenlink riders will soon be able to track on their phones the location of their bus and see how full it is. This is a long-desired benefit for riders who can now see if the bus is early or late, and it will help provide the real-time data Greenlink staff need to make smart business decisions. Other technology advancements are coming, including an electronic payment system (for those with credit cards, no more counting out quarters for the bus ride) and the much anticipated purchase of two Proterra buses (with delivery expected in late 2019). Progress on the Transit Development Plan. The TDP considers the Greenlink network from 2020 through 2024 and ways to make it useful to more residents in Greenville city and county. It recommends a prioritized service plan that demonstrates where and how Greenlink should operate expanded services in the next five years and identifies costs for this expansion. 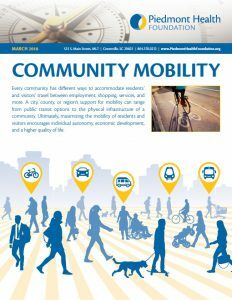 The TDP was recommended as a phase two in our 2015 mobility study and was funded in part by the Piedmont Health Foundation. The plan also considers adding routes to provide more crosstown and connecting service as well as service for commuters from Easley. Of course, these expansions are all contingent upon increases in funding. But with Greenlink’s positive demonstration of its responsiveness, innovation, and strong stewardship of resources, combined with the significant growth we are seeing in Greenville County, the case for greater investment is becoming clear. Kids won’t eat healthy cafeteria food. Cafeteria workers can only open boxes and reheat chicken nuggets. They’ll never learn how to cook. School cafeterias can’t afford to serve healthy or local food. Students don’t think school lunch is cool. When the Piedmont Health Foundation teamed up with Greenville County Schools Food and Nutrition Services back in 2010 to consider how to put a better product on the school lunch tray, these were the objections we heard in the community. Naysayers who scorned the typical school lunch at that time – hot dogs, processed chicken products, canned beans and the like – tended to point the finger at the schools as if they were stubborn or lazy or ignorant of children’s health needs to not offer scratch-made entrees, whole grains, and locally sourced produce and proteins every day. Food service personnel had great ideas of what they could offer the district’s more than 76,000 students. But they needed technical resources, financial support, and culture change in schools to get them there. This is where passing gear philanthropy came in. In 2011 and 2012, Piedmont Health Foundation provided seed funding for a culinary training program for Greenville County Schools Food and Nutrition Services staff to learn to cook healthier lunches. They did, indeed, need to learn how to trade their box cutters and microwaves for chefs’ knives and sauté pans, which they did at a week-long culinary training institute at our local Greenville Technical College. In 2013, we connected them to bigger funding sources, such as Blue Cross Blue Shield Foundation of South Carolina, Greenville Women Giving, and others. We supported LiveWell Greenville in visiting countless PTAs, encouraging them to offer taste tests to kids and promos to teachers and parents. In 2014, we gave funding for development of a communications plan for them to toot their own horn on social media and elsewhere, promoting the innovation that was becoming commonplace in the cafeteria. We did everything we could to advocate and cheer for Greenville County Schools as they rolled out exciting plans for making school lunch healthy, delicious, and – yes – financially sound. It’s now been seven years since we first asked Greenville County Schools, “How can we help?” What’s most exciting is that our help is no longer needed. Greenville County Schools Food and Nutrition Services has made the transition in every way, with talented chefs in every school cafeteria, parents, students, and employees who embrace and celebrate the diverse and unique offerings on the menus each day, local farmers who are proud to see their blackberries, apples, beef, and more feeding thousands of their neighbors’ kids, and industry partners who are eager to try the next new thing in Greenville County knowing that all eyes are on Food and Nutrition Services Director Joe Urban and his incredible team of professionals. We want to give Greenville County Schools Food and Nutrition Services a giant shout out for being a national model for how school food can and should be done. And while we are proud to say we were part of it early on, today’s innovations like food trucks for families in low income neighborhoods, locally sourced humanely-raised Brasstown Beef, seafood on the menu every week (earning a mention in the New York Times), unusual items like alligator creole (yes! and the kids are eating it! )…and on and on…that’s ALL because of the passionate team at Greenville County Schools. If you want more joy in your Facebook feed, follow them today! Read recent coverage on their new menus. And please, go have lunch at any of Greenville County’s 101 schools and special centers. I promise, you won’t be disappointed. Special thanks to former Greenville County Schools Superintendent Dr. Phinnize Fisher for supporting a pilot of the culinary school program at A.J. Whittenberg Elementary School and to current Superintendent Dr. Burke Royster for supporting its expansion to all schools and centers, and congratulations to former and current Greenville County Schools Food and Nutrition Services staff for their hard work and perseverance in championing the reinvention of school food. Posted in Transportation & Mobility, UncategorizedTagged comprehensive operational analysis, greenlink, public transitLeave a Comment on How to improve Greenlink in the near term? The downtown trolley is Greenlink’s most popular service, providing nearly 120,000 rides to residents and visitors in 2016. 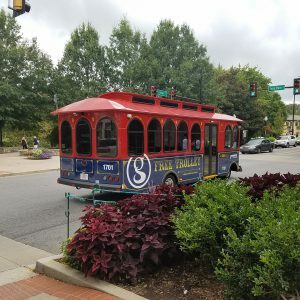 Because the service was so popular, Greenville City Council decided to set aside Hospitality Tax funds to expand the trolley system from one Main Street route to four separate routes. Since the routes launched August 3, 2017, we have heard many common questions arise about the new trolley system. In an effort to get the correct information we sat down with Nicole McAden, Greenlink’s marketing and public affairs specialist, to get the run down. Q: First, what are the basics of the expanded trolley system? Where do the trolleys operate? The four trolley routes – Heart of Main, Top of Main, Arts West, and Augusta – can be viewed here. When do the trolleys operate? – Thursday and Friday 6 p.m. to 11 p.m., Saturday: 10 a.m. to 11 p.m. and Sunday: 1 p.m. to 8 p.m. It’s important to note that the last trolley run of each night will depart from the trolley hub on Falls Park Drive 30 minutes prior to end of service. This should allow for the trolley to make one last complete loop before service ends for the night. This does not mean that the trolley will service each stop until 11 p.m.
Food and beverages – You may bring drinks that have a secure lid. No open solo cups, cans, bottles, or fast food type cups (paper cups with plastic lids and straws). Food may be transported, but must remain in containers and cannot be consumed on the trolley. Q: How is the trolley system different from the regular fixed route bus system? 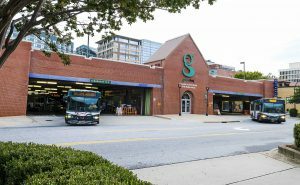 A: The trolleys are funded with City of Greenville Hospitality Tax funds (along with a Federal Transit Administration match), so they must serve City of Greenville hospitality-related venues. The idea behind expanding the trolley system is to provide a way for people to access destinations that are outside of the downtown core in an effort to share this success with other restaurants, retail establishments, parks, and tourism facilities in the city. Its hours of operation are limited to Thursday and Friday from 6 p.m. – 11 p.m., Saturday from 10 a.m. – 11 p.m., and Sunday from 1 p.m. – 8 p.m. The existing fixed route bus system provides transportation to a variety of locations, including jobs, schools, shopping, residential and retails areas, and more, and is funded by federal, state, and local sources and passenger fares. It runs in various geographic locations throughout the county. Its hours are Monday – Friday, 5:30 a.m. – 7:30 p.m. and Saturday 8 a.m. – 6 p.m.
Q: What process was used to create the new routes? Once the criteria were set and proposed routes were drawn, Greenlink staff held three public hearings to gather input and feedback, much of which were incorporated into the new routes that are running today. Q: Where can you get on and off the trolley? Q: Can I request new stops to be added? A: Not surprisingly, the new trolleys are popular and residents are already submitting requests and ideas for stops, and Greenlink staff are continually evaluating the stop locations in order to make changes that would better serve passengers. – Space to pour an 8 ft. by 5 ft. concrete pad. This landing pad must be flat and tied into other infrastructure (such as sidewalks) to adhere to the Americans with Disabilities Act and create access for all ranges of mobility. The trolleys are equipped with a wheel-chair ramp or lift, and this pad is an essential component to ensuring the ramp/lift works correctly. – Approval from the entity that owns and maintains the roadway. Many streets throughout Greenville are actually owned and maintained by the South Carolina Department of Transportation. Before Greenlink can install any new stops on an SCDOT roadway, Greenlink must obtain an approved encroachment permit from SCDOT. The permitting application ensures that the stop won’t create any new safety hazards. – Adjacent property owner buy-in. The point of the trolleys are to provide transportation for tourists traveling through town. Many businesses are excited about stops being installed near their location, as it could lead to increases in customer traffic. However, trolley stop locations throughout residential neighborhoods are trickier, and Greenlink is interested in pursuing stop locations that are agreed upon by the adjacent property owners. While the stops are installed in the public right-of way, and therefore don’t require property owner approval, it’s important that Greenlink receive support from the neighbors. The Arts West Route and the Augusta Route are both funded through October 2017. Between the months of November 2017 to April 2018, Greenlink staff will evaluate service performance and make tweaks to service. Q: Can I rent the trolley for private events? A: No. We know residents love the trolleys, but the Federal Transit Administration prohibits any charter services from agencies using vehicles intended for public transportation. Q: Will we see trolleys anywhere in the County or other municipalities? A: The City of Greenville was interested in bringing trolleys to City residents and visitors to transport them to hospitality destinations using hospitality tax dollars. If other local governments or private funders or companies are interested in exploring using trolleys or other forms of transit to move residents and visitors, Greenlink staff are willing to explore the opportunities. This summer, the Piedmont Health Foundation hosted its first “Greenlink Field Trip” with twelve enthusiastic participants from Westminster Presbyterian Church and Furman University’s OLLI program. The field trip aims to get non-riders to ride a Greenlink bus and to educate them about our public transit system. 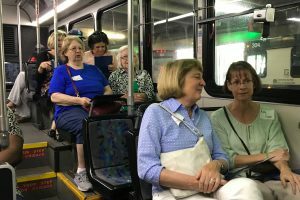 Participants took part in the full transit experience, meeting at Westminster Presbyterian Church and catching a bus on Augusta Street to Greenlink’s downtown transfer facility. The new riders hustled to their bus stop only for it to arrive five minutes later than expected, prompting several concerned murmurs of whether we had missed the bus and ruined the day’s plans. The field trippers realized that their concerns and worries likely emulate those experienced by everyday riders. Fortunately, the bus was cool and shady on a hot summer’s day, and our group arrived at the bus station right on time. Although they were given day passes, the newly recruited riders still had the task of figuring out how to pay the fare which they were able to do after a little assistance from the driver. The participants’ best personal experiences came from talking to everyday riders while on the bus. Our participants were moved by the stories they heard of dependence on transit and the difficulties many of the riders faced. One field tripper talked with a service worker who had broken her foot and was unable to drive and had to walk two miles to the nearest bus stop just to get to work. Other participants heard stories about the need for extended hours or routes to suit critical needs such as employment. These discussions left our field trip group impassioned and ready to demand changes in Greenlink’s service to be sure that all these people’s needs were met. Our guests were warmly welcomed at Greenlink’s transfer station by Nicole McAden, Marketing and Public Affairs Specialist, and Gary Shepard, Director of Public Transit. Nicole and Gary educated their new found riders about Greenlink’s system operations, funding sources, constraints on service, and opportunities for growth. Participants were astonished as they realized that there is a lot more to Greenlink’s service than meets the eye. They were impressed to discover how Greenlink was such a good steward of its allotted resources. The group engaged in a discussion which was fueled by the people they met and the stories they heard on their bus ride to the station. The group was eager to improve transportation for all Greenville citizens, from the frequent riders they had met earlier that day, to current non riders like themselves. They were motivated to advocate for improved and expanded public transit because better transit means a better Greenville for everyone; transportation opens doors for employment, education, health, and affordable housing. 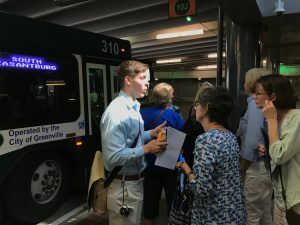 The group ultimately concluded that Greenville cannot grow and thrive without also growing its public transit system. The trip back to Westminster was filled with positive feelings and commendation of Greenlink’s staff and services. There were discussions about how to support the system, educate friends and family, and encourage support from our local government. As one participant observed, Greenlink had previously been an afterthought to her, perceived as an inefficient bus system with low ridership. Now, she has gained a new found respect for the system and the important role it plays in so many Greenvillians’ daily lives. 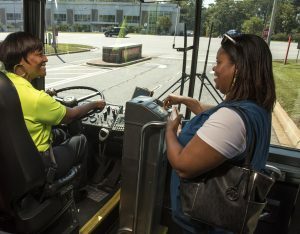 She realized that even though she will not be a core rider, Greenlink’s services are crucial to making Greenville thrive now and in the future. Overall, the Greenlink Field Trip was a resounding success, educating and exciting a new base of support. Greenlink has recently gained significant momentum with the establishment of new management, the completion of their Comprehensive Operational Analysis, and their application for the “Low-No” Grant which could award them up to 6 Proterra electric buses. It’s a new day for Greenlink, and it’s time to reintroduce people to Greenville’s mass transit system. If you’re interested in participating as an individual or scheduling a field trip for a group, please contact Sean Rusnak at seanrusnak@piedmonthealthfoundation.org.